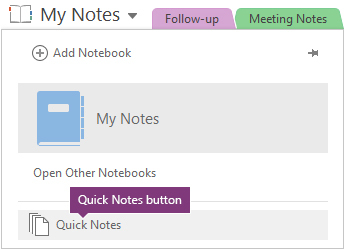 This issue can occur when you click the Quick Notes button at the bottom of the notebook list when the notebook containing the Quick Notes section is already open in OneNote. Update your installation of OneNote 2016 to the most current version. To do this, click File > Account, and then click Update Options > Update Now. 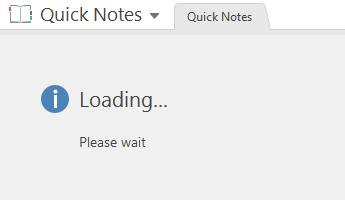 Restart OneNote when the update is complete, and then try using the Quick Notes button again. In the notebook list, right-click the notebook containing the Quick Notes section you’re trying to open, and then click Close Notebook. When the notebook disappears from the notebook list, click the Quick Notes button at the bottom of the notebook list again. In the notebook list, click the notebook containing the Quick Notes section, and then click the Quick Notes section tab near the top of the OneNote window (in this case, do not use the Quick Notes button at the bottom of the notebook list). If you have followed the previous workaround steps and are still having trouble, please leave a comment in the “Was this information helpful?” feedback form to let us know. Thank you!